Gretchen Rubin, New York Times bestselling author of The Happiness Project, knows a lot about what makes employees really happy. “Happiness is affected by [employee’s] sense of control over their lives,” says Rubin. In fact, we have to do better – now more than ever – to improve employee experiences. According to a recent report from Gallup, in a world that relies on being connected 24×7, more than half (51 percent) of the US workforce is not engaged. Organizations offer the same old setup, practices and infrastructure that don’t suit the modern day employee. Most employees feel overburdened and under appreciated by the lack of generation-appropriate infrastructure upgrades. There’s no doubt that happy, motivated employees are more productive and loyal. So the real question is, how can you improve your employees experience so that they can perform at their best? With Office Chat, our aim is to help organizations communicate better, improve overall productivity and replace all outdated communication medium that hamper growth. We have been evolving continuously to provide state-of-the-art features to companies worldwide that help them enhance their employee experience by improving productivity and engagement. With over 60 billion smartphone users estimated by 2020, one way employers can change their culture is to enable smartphone technology at their workplace. Using a secure business communication messenger such as Office Chat on smartphones can help make communication transparent. With Office Chat, employees feel connected and much more informed. Employers can be assured that their confidential data remains secured. Various mobile teams such as sales, support, etc. can respond quickly to any updates. 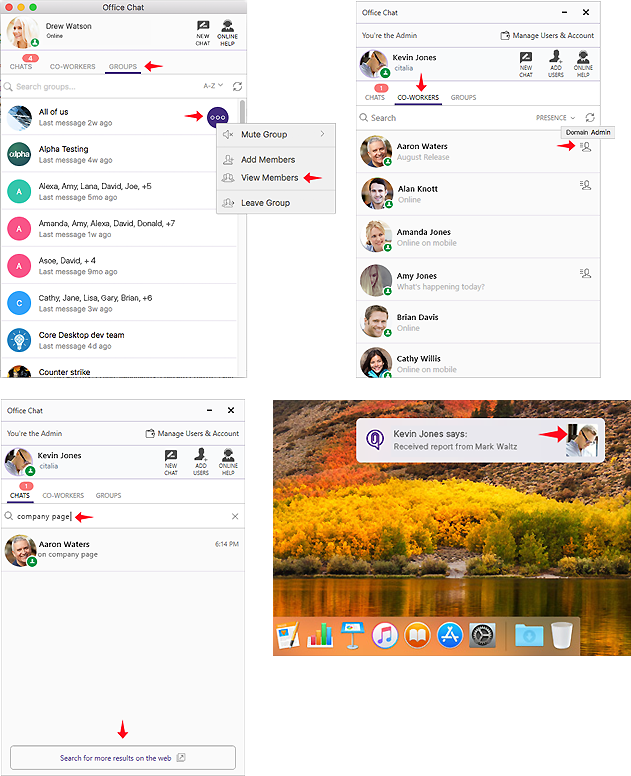 Office Chat works seamlessly on multiple platforms such as desktop apps (Windows & Mac), smartphones (Android & iPhone) and web browsers to ensure that your on-field, office-based or remote workforce stays connected. 2. Asking Employees: How Can We Be Different? Most successful and innovative companies have known for a long time that employees are the best source of ideas. Despite being full of creative ideas that might help the company, many employees find that they do not have the capability within their company to fully express them. This can be due to poor infrastructure on the side of the company or reluctance on the part of the employee due to number of reasons. In order to promote sharing of ideas within your organization, employers must implement means where employees can express themselves freely. Using traditional media like emails or elaborate measures such as meetings might not necessarily help with individual creativity. Can you really risk a game-changing business idea from one of your employees to lie dormant in an email thread? Office Chat offers private chats as well as dedicated groups that can be used to communicate ideas by the employees. Office Chat team-based groups can help you to create and open lines of communication for specific teams, projects and departments to communicate seamlessly and share ideas and documents within the groups. This also helps owners and managers become more accountable while the team invests time and energy into brainstorming ideas that could become highly profitable for the business and improve customer service. It is also important that new concepts are not just discussed among peers but also implemented in a timely manner. Upper management can remain involved as well and step in at the appropriate time to ensure smooth implementation of these ideas. One of the advantages of having a simple and secure instant messaging application like Office Chat is that the feedback can be shared in a transparent and timely manner. You can simply create a group to include only relevant users to share ideas, brainstorm and discuss strategies. Better communication internally can help teams become more productive. In order to improve overall employee experience, it is important to encourage team members to talk, share experiences, ask questions and request learning opportunities. In fact, colleagues are able to ask for assistance and collaborate far better in a transparent workplace culture as opposed to writing a formal email. Often the team that performs consistently well has better collaboration, trust and risk-taking attitude that not only helps individual stakeholders but also the entire unit. With Office Chat better group communication can be encouraged using dedicated groups for teams, projects and departments. Files, documents and other rich media that are shared within these groups can be viewed, maintained and searched from anywhere. Group admins can monitor conversations and assist members with their queries. Office Chat groups can also be archived once they are no longer in use but do contain important information that might be required for an audit in the future. Groups such as ‘Admin Announcements’ can be used effectively to communicate official information to all employees. Today, with the rising number of smartphone users, business communication has changed quite rapidly in recent years. Employees can now be much more productive and creative outside of their email inboxes. Traditional communication methods such as email, fax and memos served a valuable purpose at one time, but might not be relevant in today’s modern workplace. Email, for instance, is likely not the best way to have a meaningful conversation with someone. Many successful organizations are now replacing email with instant messaging tools such as Office Chat. Because they realize that relying too heavily on one particularly rigid method of communication hinders their growth. The challenge lies in replacing age-old communication practices with a robust, powerful and secure messaging application. Check out our blog post on How to switch from email to Office Chat. There was a time when one-way communication was the only approach employed by many businesses. Decisions back then were made completely by upper management and the workers merely followed orders without any scope of contributing ideas or feedback to management. Although it may provide a complete sense of control, one-way communication will shut down ideas from your employees and hamper your growth as compared to competitors who listen to their employees. When you don’t listen to your employees it’s tagged as the biggest mistake ever in business. There are many people, often outsiders, who can offer you insight but employees are the ones who offer more. Employees who are close to your customers and your operations know where flaws exist and can propose solutions. Office Chat features such as Group Chats and Private Chats are the best way to promote two-way communication. These features will help employees share their ideas and feedback and will help employers build a company culture that nurtures open communication. Also, management can still have complete control of their Office Chat network via the admin portal. A recent study found that remote workers achieved a 13% improvement in their performance as compared to in-office workers. A remote working environment not only benefits employers but also employees. Employers can reduce overhead by having a talented, remote workforce. With cloud-based applications, these remote teams can share documents, videos or use teleconferencing for effective communication. Also, employers can attract talent by offering the option to work remotely thus having a competitive edge over companies with no such option. Office Chat ensures that your remote teams are able to communicate effectively and you are able to build an excellent team of talented and hardworking remote workers. With Office Chat you can create a virtual workplace to help your remote workers interact with the workforce. Video conferencing, as well as file sharing (up to 2GB per file), help remote workers using Office Chat overcome infrastructural limitations that often hinder productivity. Check out our blog post on 12 Ways Office Chat Can Help You Embrace a Remote Working Culture.